They say March is in like a lion and out like a lamb, and with that means warmer weather for most. Grasses turn green, and trees, shrubs and bulbs start to burst forth pleasing colors, leaving behind the grey winter doldrums! Color perks up too in the wild birds we see-as the warmer weather brings back many who’ve migrated for winter. Nesting season can be fierce, as competition for suitable nest boxes reaches its peak time. A Wood Birdhouse provides a much needed refuge in your backyard. It doesn’t need to be a plain nest box, as the designs available today are fantastic! As long as the entrances are proportionally correct, and there are clean outs, most wood birdhouses are good to go. The fun designs above are hand carved, and painted with non-toxic paints and finishes, and are crafted from fast growth albesia wood. What a fun way to help birds thrive! As spring approaches, nesting season begins for many wild birds. 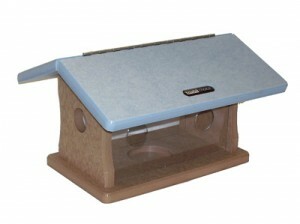 The task of finding suitable nest boxes is difficult, as birds far outnumber available birdhouses. Adding attractive, whimsical birdhouses to your yard helps wild birds to thrive in many ways, plus adds life to, and brightens up your environment. Protection from the elements and from predators are two other reasons birds seek bird houses as shelter, they’re not only for nesting purposes. 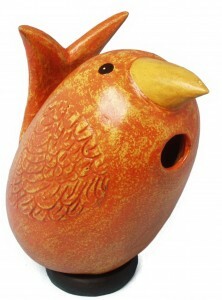 Today, there are a myriad of fun, and unique birdhouses that will create a touch of whimsy in your yard. Classic architectural styles create a nice statement too. Materials like stained glass and copper, weather proof stoneware, ceramics and wood are available. 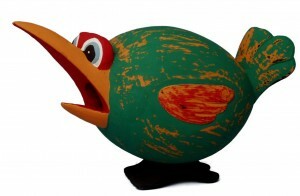 The choices are endless, with functional art for your yard the birds will truly appreciate. Please help house the birds! Spring is just around the corner….and it promises that birds who have gone elsewhere for the winter will soon be returning and bringing more color and activity to our backyards. Very soon you can see brilliant Bluebirds, Dazzling acrobatic Hummingbirds, Bright Goldfinches, Orange Orioles, & more in your yard! Best of all you don’t have to keep just bird feeders full of seed to attract them. Water, nesting material, native plants, fruit, and sugar can be instrumental in attracting these and other colorful spring birds. Don’t forget too, that now is the time to clean out, check, and repair any nest boxes you have. Here is something pretty amazing! 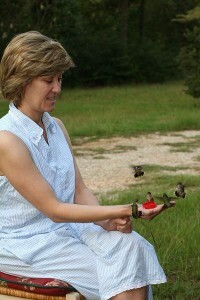 This woman lives in a Hummingbird fly zone. As they migrated, about 20 of them were in her yard. 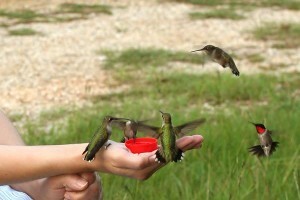 She took the little red dish from the hummingbird feeder, filled it with sugar water and this is the result. Thanks Mr. and Mrs. Alfano for the wonderful photos! It’s almost that time of year when the Ruby-Throat Hummingbirds are bound for that perilous journey from their winter grounds in Central America. Flying thousands of miles across the Gulf of Mexico, they will flood the eastern parts of the U.S. to the delight of many backyard birders. 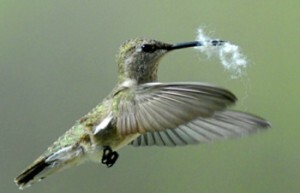 At the same time, the Black-chinned Hummingbirds and others will migrate out of Mexico and settle in the central and western U.S.
Hummingbird feeders are not the only thing to attract the tiny jewels to your yard. New birding accessories like the leaf mister are absolute hummingbird magnets–they will flit, fly and dance through the gentle spray! 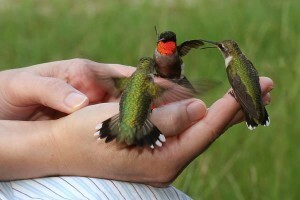 The newest hummingbird accessory is the Hummer Helper. This is a flat wire basket filled with a special nesting material proven to be used by hummingbirds. 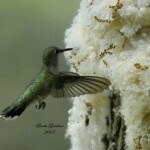 The Hummingbird Society even endorsed this product, and will feature it in their upcoming newsletter! Separate refills are available too. 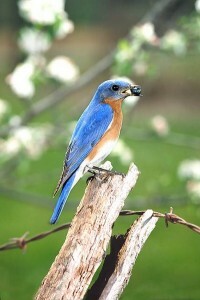 Seeing this seasons’ first bluebirds in my yard, it was the perfect reason to put up a new bluebird feeder. This year I opted for one of the recycled models by Birds Choice. 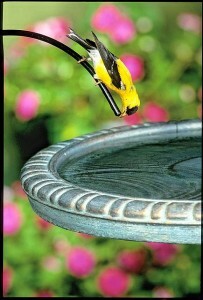 It cost a few dollars more than a wooden feeder but the investment was well worth it! This blue bird feeder not only has openings on either end, but two more additional openings on each side of the plexy panels. A total of six openings…a unique feature for these types of feeders, it allows easier access and escape from from predators. At first glance, and by the weight, I could tell the quality was of very high standards. Then, the label stating that “this bluebird feeder kept 33 plastic containers out of landfills” just makes one think how easily they created a positive reaction for the environment. I know this blue bird feeder will last a very long time, as Birds Choice guarantees their recycled products never to crack, split or fade. Can’t wait to see the bluebirds start using it! Oh yea, here’s my bluebird feeder, complete with a new baffle for extra protection. 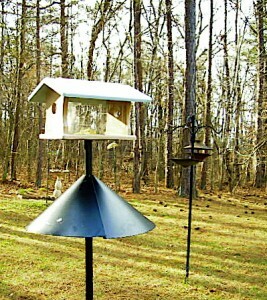 Fly Thru Bird Feeders are wonderful as they can accommodate such a wide variety of birds and foods. Anything from mixed birdseeds to suet, and dried fruit to meal worms can be fed in a fly thru feeder. Their practicality makes them an obvious choice if you are limited on the number of bird feeders you can have. 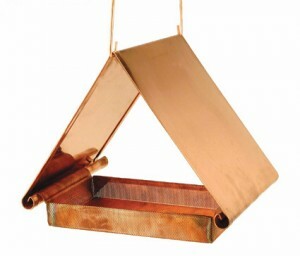 These innovative, hand crafted fly thu bird feeders can also be used as birdbaths. 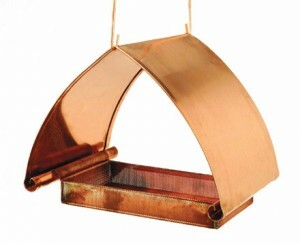 They are are made of solid copper and the trays are watertight. The unique design of the curved handles slides right into the roof. Birds and food are protected from the elements. These architectural, simplistic designs add beauty to any landscape, and the copper weathers over time to a lovely patina finish. Totally functional art for your feathered friends that will last a lifetime. With the nesting season approaching for many birds, finding a suitable nest box isn’t always easy. 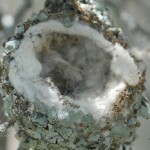 Nesting birds drastically outnumber the available rental units! Having wood birdhouses in your yard greatly helps wild birds nest and raise their young, while also giving life saving shelter and protection from predators. 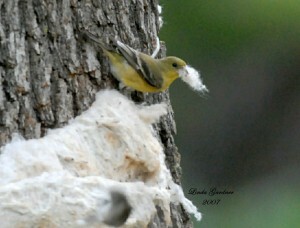 In the photo above, an American Goldfinch gathers cotton nesting material for its nest construction. Various materials are used by different species of birds ranging from twigs, grasses, roots, and straw, to feathers, mud, bark, lichens and moss. Commercial nesting materials are available and are of tremendous value to the many types of wild birds. They consist mostly of cotton, feathers, strings, and other tiny shreds of fabrics. Dryer lint works well too! Help out your feathered friends with birdhouses and nesting material before the season starts, and you’re likely to see a “no vacancy” at your birdhouse. The Great Backyard Bird Count (GBBC) takes place this month, specifically between February 13-16. This is a joint effort of the Cornell Lab of Orinthology and the National Audobon Society. The project links citizens with scientists in an effort to collect important data about backyard birds. This is the twelfth year the project has been running, and each year becomes more successful with participation of new backyard birders. An extensive data base is analyzed by scientists to better understand many aspects of wild bird populations, such as: migration patterns, habitat changes and range expansions. A favotite backyard songbird, Goldfinches are admired for their vibrant yellow color, enchanting song and graceful flight. People call this bird the “wild canary”, but in fact, goldfinches are not gold all year long. As the nesting season winds down, their fall colors appear by molting. They shed older feathers for new ones. It is the males’ appearance which changes drastically to a dull brown, and he loses his stunning black cap. The females molt as well, but their appearance doesn’t change much. Goldfinches wearing drab winter plumage flock to thistle feeders in winter. By keeping thistle feeders out all year long, you’ll enjoy their vibrant sunny colors in warmer months. Unlike other wild birds who frequent bird feeders, Goldfinches eat thistle, also called nyjer seed, almost exclusively. Even tiny babies in the nest are fed partially digested thistle seed. Perched at and around thistle feeders, Goldfinches eat seed afer seed, which gives a wonderful opportunity to view them at length. The Rainbow Finch Feeder has 18 perches, and once Goldfinches find this, can empty 2.5 quarts of seed in two or three days. 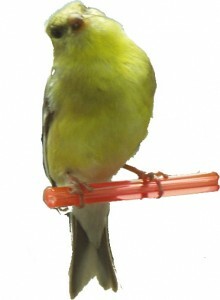 The Finches Favorite 3-Tube Feeder has 24 perches which allow you to view all birds at once.